Will Palin’s Next Kid Be Named L. Ron? It seems a troublesome advisor named John Coale, husband of Fox News’ Greta van Susteren, is mucking about in the Alaskan Governor’s political operation and some of her old-time loyalists don’t like it! Alaska Gov. Sarah Palin continues to suffer growing pains as she attempts to build a national political operation in hopes of positioning herself as a viable presidential candidate in 2012. The latest bump in the road comes in the form of a Politico article — headlined “Staff Infection: Allies Rip Palin Team” — that features any number of juicy quotes that all point to one fundamental problem: there appears to be a significant disconnect between Palin’s official governor’s staff and the group of advisers that have grown up around her new leadership PAC. At the heart of the problem, according to Politico, is John Coale, who, as the Fix first reported, is serving as an informal adviser to Palin. Coale, an affluent trial attorney who has given significant sums to Democrats in the past, also happens to be the husband of Fox News Channel’s Greta Van Susteren. Coale: Stoking trouble in the Palin posse. The Politico article gets right in the middle of the fray and starts mixing it up. According to DC peeps, the Alaskan staff is a bunch of idiots who are mismanaging Palin into oblivion. Coale told POLITICO he first met Palin during his wife’s taping of a September interview with the Alaska governor and explained that he was “extremely pissed off at the way Hillary was treated” and believed Palin was being subjected to the same “sexist” treatment. Coale ultimately endorsed McCain in the 2008 campaign. “I’m just a friend of hers. I’m not on her staff and I’m not paid,” Coale insisted. A former Palin aide said Coale “was positioning himself for this gig from the first interview,” always there with his wife when she would sit for what were invariably friendly sessions with the governor. Another former Palin ally still in touch with the governor was blunt when asked to explain Palin’s missteps since the election: “Taking advice from Greta and her husband,” said this source. Several aides and allies from inside and outside last year’s presidential campaign complain of being frozen out by the Alaska governor’s staff and even those who are still in touch with the governor suggest her string of unforced errors are the direct result of having nobody around her to offer sound political advice. Jason Recher, who traveled with Palin throughout the campaign and remains in touch with her, chalked up some mishaps as a result of the governor’s overabundance of caution concerning the ethics of mixing political and official activities. But Recher, a veteran of both terms in the Bush White House, indicated he shared the concerns of other Palin allies. “Nobody from the campaign who I am in touch with knows who is at the PAC, who is really staffing it or what exactly it does,” he said. Like the others, Recher said he was speaking out for somebody he grew close to last fall. “I may not be in the loop on the strategy going on right now but I totally buy into the notion of Sarah Palin,” he said. 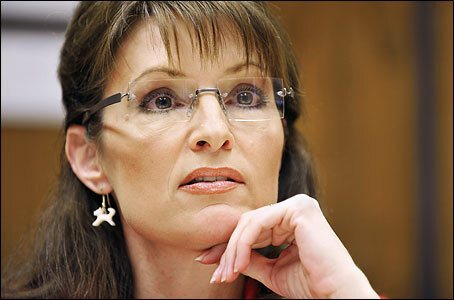 Palin has endured numerous bruising trips through recent news cycles. There was the infamous YouTube turkey video in November where, unbeknownst to Palin, live turkeys were slaughtered just behind her within the camera frame. Then came a flap over remarks she made to a filmmaker in January. In February, conservatives were confused by her last-minute no-show at a key movement event. Most recently, Capitol Hill Republicans were left scratching their heads over a bizarre miscommunication between her office and the two national party committees. In that case, Palin, the National Republican Senatorial Committee and the National Republican Congressional Committee all were left with egg on their faces. The NRSC and the NRCC, it seems, were under the distinct impression that Palin would headline the annual Republican House-Senate fundraising dinner in June. The committees went so far as to issue a joint press release trumpeting her appearance and national news outlets quickly noted her prime speaking engagement. All of it was news to Palin, though. When the Anchorage Daily News called for comment, Palin spokesman Bill McAllister said the governor didn’t know anything about the event. The national committees, meanwhile, explained that Palin’s appearance had been confirmed by SarahPAC, Palin’s Virginia-based political action committee. “She is great, but she is ill-served by a staff that is clearly in over their heads,” added a national Republican operative who has worked with Palin. This political infighting is amusing, but it is NOTHING compared to the dark truth about John Coale. He’s not just a Fox News spouse. He’s a devotee of the craziest belief system since Joseph Smith went digging on the Hill Cumorah. Gawker has been all over this from the jump-off. It’s amazing. John Coale, currently advising Sarah Palin on running for president in 2012, is a Scientologist. And according to a memo obtained by Gawker, Coale once plotted to use friendly politicians to advance the power-hungry cult’s agenda. In 1986, he masterminded a plan—which was never executed—for Scientology to get into the “MONEY and VOTES game” in order to “create power” for Scientology and win influence Washington, D.C.
Not just to advance and protect the Church, of course! Their REAL goal was to help America! For as Tom Cruise tells us, sometimes Scientologists are the only ones who can really save the day. And that’s all John Coale wants to do. Help Sarah Palin become “clear” enough to rebuild America. Assuming she could square the whole Scientologist-advisors thing with her fundie fanclub, of course. Hey there, can I interest you in a free personality test? Bristol and Willow could be married off to fey male celebrities with a passion for dance, boosting the clan’s Q-rating! Just think of what People magazine would shell out for the exclusive pictures of their dual wedding to Zac Efron and Lucas Grabeel! Finally rid of those pesky body thetans, eldest son Track could kick his painkiller addiction! Thanks Narconon! And little Piper Palin, who seemed to enjoy a taste of the finer things during the campaign, could hit it big when Scientologist Paul Haggis casts her in his next Oscar-winning film! Piper: Starring role in “Crash 2” means there’s a lot more Louis Vuitton where that came from. Sure, becoming a Scientologist would probably waylay the Governor’s ambitions for national office. But realistically, is this woman really going to be elected to anything outside of the crazy state she calls home? We say Scientology looks like a big winner for the whole Palin clan. Don’t be so selfish, Sarah. Listen to Mr. Coale!